2013 getting into shape. — Randy Zabarsky.. My Life.. I have had a problem with weight since I was 12 and went from a 90 pound weakling to a 130 pound weakling. Stepped on the scale in January and it said 251 pounds. A few days later Mike Seagroves emails me that a lot of things have changed in the last year since I had seen him and to give him a call. That change was him getting into shape. He said that I should start doing something like P90X. I told him that I tried it but never got past a few weeks and that was skipping ones that I didn't want to do like Yoga X. He then suggested Power 90. So in order to get ready I had to fill out my goals and motivations and the worst thing ever..To take pictures of myself with no shirt. Really.. Really.. I didn't want to do that. I told him that it just sucked but I had my wife take the pictures. These are pictures that will never been seen by anyone I told myself. So on January 14th I pushed play for the first time in years. I joined Dr. Roizen e-coaching through work in the middle of March because I was not eating as well as I should have been. At the end of March I lost 10 pounds since January 14th. 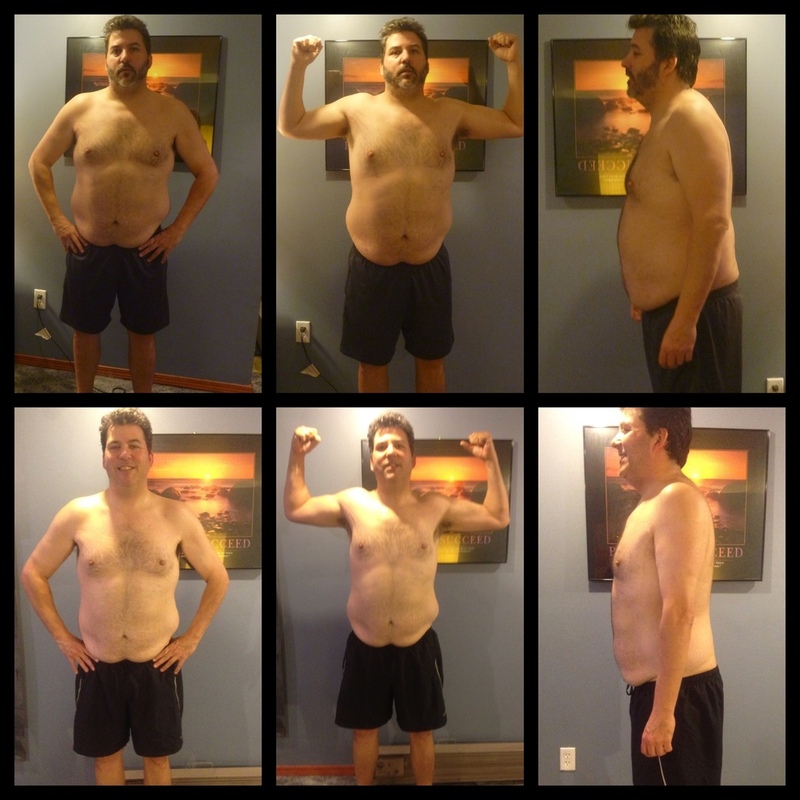 After completing almost 75 days of Power 90 Mike said they were doing a P90X start on April 1st and I should start then. I was going out of town that week so I posted to Fit-Spot how I should get my workout done in the hotel and was given many good suggestions. The first day of Yoga was horrible. I did 60 minutes and stopped. Mike said just do the last 30 minutes later. In April I was on a Whole Food Plant Based diet study (Lifestyle) for one month. Now we fast forward to today. I look forward to each day of P90X even the Yoga. I am down to 220 pounds that is 31 pounds lost this year. I am fitting into shirts and buttoning the top button that I have not fit into in 5 years. My ties are somehow longer then they have been in the past. I have dropped over 2 pants sizes. I am loving the Whole Food Plant Based Lifestyle. I have 30 more days of P90X and I am going to do another round of P90X.